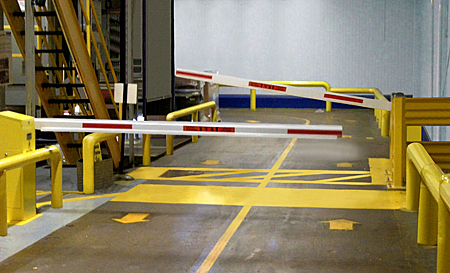 Synchronizes five mixed pedestrian and forklift gates to manage a difficult crossing area. This system helps protect pedestrians as they enter the dock area from a personnel door into a busy dock area with multi-directional traffic. This is a summary of three solutions for a blind intersection for two forklift aisles and a pedestrian traffic lane. In complex circumstances like these, there are many solutions. What would be right for you? In this operation, the pedestrian aisle crosses forklift aisle where lifts enter to remove products from a stretch wrapper, creating a potentially dangerous area where drivers, distracted as they load or unload pallets, could injure workers on foot. Manages forklift and foot traffic in and around a robotic manufacturing work cell to reduce chances of forklift collisions and manage pedestrian traffic. Help control pedestrian traffic flow at warehouse entry points. These are typically blind spots for individuals leaving an office, and entering an area where forklifts or other industrial traffic is present.